Day 1015 - How about a little ham with that cheese? Here is one of my very favorite photos from Thanksgiving week. 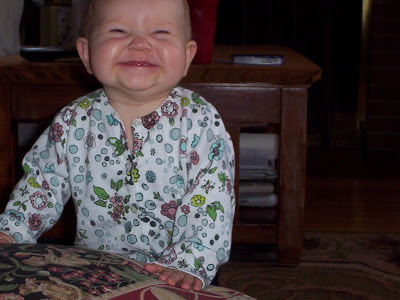 Savannah couldn't smile any bigger if she tried - her whole face is smiling! Just too adorable for words. Sorry for chopping off the top of Savannahs head, my bad. 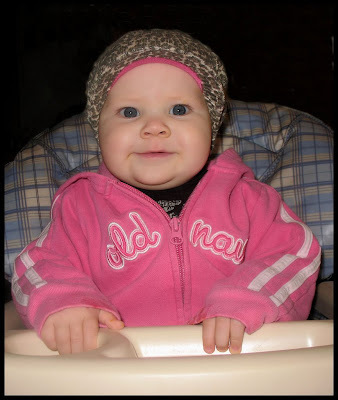 She is wearing a gorgeous sweater that Aunt Nancy sent her - it is so grown up looking I would wear that myself! Charlie and I are leaving shortly for the health club, then grocery shopping. Maybe I'll have time later today to send Heather some of my favorite pictures. I am out the door to go to water aerobics, then maybe go see 'Twilight'. Ooooooo. Day 1013 - Turkage plus one! I am still digesting - how about you? My plane leaves at 7:45am this morning, so it's off to the airport for a (hopefully) smooth and NON-DELAYED flight. I hope I don't have anyone sitting in the middle seat tomorrow - I might need the extra room to stretch out and sleep. We had a wonderful dinner yesterday and Thanksgiving was extra special with the family. And I am REALLY thankful! THANK YOU THANK YOU THANK YOU Lyn and Steve for your hospitality this week. THANK YOU THANK YOU THANK YOU Heather and Savi and Evan for coming to visit every single day. THANK YOU THANK YOU THANK YOU Mom and Gil for driving all the way from Maine to see us and bring us lobster. THANK YOU THANK YOU THANK YOU Cheryl for being such a great friend. I will have time to recuperate this weekend from my trip, then back to work on Monday. Day 1012 - Happy Turkey Day! It's time to start stuffing the turkey and a race to see who falls asleep on the sofa first! I sent out a card that said 'Today is the first day of the REST of your TURKEY'. I feel terrible when I don't have any leftover turkey, by the way. I LOVE turkey and I don't usually make them except for Thanksgiving or Christmas! Somehow we consumed several kinds of bread, two kinds of stuffing, sweet potatoes, mashed potatoes, squash, turnip, broccoli, corn, salad, ham, turkey, and a million desserts. We will have a similar menu today with the addition of a pork pie, chips and dip, and peas and onions. No corn, no green bean casserole (in case you were wondering). Have a Happy Thanksgiving, everyone! TTFN! Day 1011 - Thanksgiving Eve! This photo of Savannah is extra cute, (though not from this trip). Can't wait to see my photos! The countdown to 'Turkage' is on - but wait! We are having another Thanksgiving dinner this afternoon at Heather's in-laws. Lucky us! I think it's nice when people celebrate holidays (especially Xmas and Thanksgiving) on an 'off day' so attending doesn't cause a conflict. Since I am here - I have given out a lot of Christmas cards early, and brought whatever gifts I could (including homemade jam) instead of mailing them later. My mother and my sister did the Thanksgiving shopping yesterday - $240. There is an entire cooler in the back hall filled with just vegetables - potatoes, sweet potatoes, turnip, parsnips, squash, green onions, etc. The turkey is a fresh Butterball turkey, weighing in at just under 20 lbs. I am on my SIXTH Charlaine Harris Sookie Stackhouse vampire novel. I am having a blast reading them. I stayed up till 1:30am finishing 'Dead as a Doornail' last night, and am starting 'Definitely Dead' this morning. Gotta go read - TTFN! Day 1010 - Awful Awful, anyone? We are having a wonderful week visiting with the 'fam', and my mother brought LOBSTERS from MAINE for us to eat yesterday. Thanks, Mom! Do you know what an 'Awful Awful' is? If you're from Rhode Island, you would know. 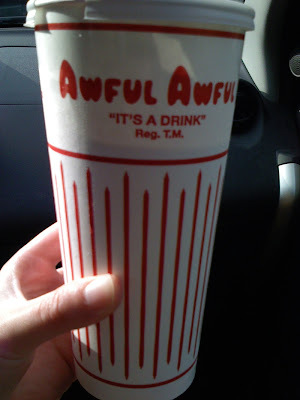 An Awful Awful is a 24 oz milkshake, a signature drink of Newport Creamery stores. My son arrived the other night after work with a chocolate Awful Awful, mixed with 'Jimmies' a.k.a. chocolate sprinkles. YUM. They are 'Awful' big and 'Awful' good, and there is a standing offer that if you (yourself) can drink three of these, they will give you the fourth one, free. On May 4th 2009, the Awful Awful will have its 60th anniversary. Hey! That drink is older than I am! You can check out the FAQ regarding Awful Awfuls on the Newport Creamery website. Day 1009 - Monday Morning and No Blahs! Look at this darling girl - and yes, in case you are wondering, I got to hold her and squeeze her yesterday! I brought her an assortment of 'Grammy Goodies'. Books, puppets, and a purple Monster outfit I bought on Halloween clearance. I MUST have a picture of her in that outfit. I took a lot of pictures yesterday. I am sure most of them are not as adorable as this one, but I am hopeful! Today my mother is arriving from Maine, and we'll be working on our Thanksgiving menu. I have finished the first two books in that 'Sookie Stackhouse' series. I only have one more! Eeek! I'm going to have to hit the bookstore later this week or at the airport. The morning is zooming by, and I have to get in the shower, so TTFN! Day 1008 - I'm here! LOOK at this smile! 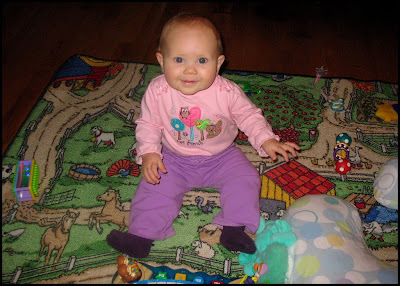 OMIGOSH she is the cutest thing and looks so grown up in this picture! I get to see Heather and Savi later today, Hooray! I'll bet I SQUEEZE her till she squeaks! Well, I spent most of the afternoon AND evening at the airport last night, finally getting to my sisters house around midnight. When I checked in my bags, I looked on the board and my flight was delayed. A little later, the time was delayed MORE. A little later, MORE. Sheesh. My bad - should have checked before leaving the house. Oops. I did wait for my bags to go through the TSA screening process. I had a big tub of homemade jam in my big suitcase. Of course, the jam box got the security folks interested in the contents of the jars. They opened my suitcase, took out the jam box, opened the tub, and took out some jars. After a visual inspection, they also 'swabbed' them to be analyzed, and reviewed the analysis. (I wonder what it said? HOMEMADE JAM? Calcium from the water?) Then the TSA agent repacked everything carelessly, and sent the bag on it's way. Thankfully nothing is broken, as far as I can see. So - back to my 4 hour wait in the airport. What did I do with all that time? If you know me, you know I made a beeline for the bookstore and looked for a book. After MUCH deliberation, I bought a book named 'Dead Until Dark'. This book is the first of a series of 'horror and humor' vampire books that the 'True Blood' HBO series is based on. (Yes, I've already read Twilight - thats a different author - and can't wait to go see the movie). Very entertaining reading - so entertaining that I finished the first, 300 page book this morning, and purchased the next two while I was still in the airport. Buying 3 books at Hudson Booksellers (at full price, mind you) qualified me for a free tote bag, which helped out on my trip. Anyway - long story short - I'm here, unpacked, and ready for my Thanksgiving week of fun! Have a great Sunday, everyone! TTFN! Day 1007 - Freezing and Cooking at the same time! Here is yet another adorable photo of Miss Savannah. It is FOURTEEN DEGREES here this morning, they were talking about us setting a record for cold this month. So much for global warming. I am 'AlGore-aphobic' on that topic. Ha! My 'getting ready for my trip' agenda changed a bit last night. I stopped at Big Lots to get some of those turkey sized aluminum pans - you can throw them away and that helps with the cleanup. I stopped at Aldi because they had fresh Butterball turkeys on sale, and bought one (plus a couple other things). I carelessly tossed the turkey on top of a couple of frozen food items in the bag in the car. When I took the turkey out of the bag, there was a pinhole LEAK in my turkey bag! I didn't want to freeze it, because I wouldn't have time to defrost it when I return from my trip. I didn't want to patch the hole and hope for the best, because it might be spoiled when I return! So, I whipped out a turkey oven roasting bag from the drawer, put it in one of my new pans, and COOKED A TURKEY last night! I have already dissected it and frozen several packages of meat. I also froze the turkey broth and giblets to make gravy when I return. When I come back next Friday, we can have a turkey dinner anytime, just by defrosting some of the meat and making the gravy! Cooking a turkey was NOT on the schedule, but it worked out just fine! I'm heading to New England on the afternoon nonstop flight. TTFN! Day 1006 - Pass the Fritters, please! I have 'Frittered' away my blogging time this morning... Sorry about that! First, the trash can in the master bath was full (I emptied both a shampoo and a creme rinse bottle, and we changed out the toothpaste). I took out the trash and replaced the bag, frittering away precious blogging time. Then, my bangs needed trimming before my trip tomorrow. More time frittering. After that, the hand towel needed replacing. Then, I remembered something to put in my suitcase. Then, I thought about laundry I would need to wash tonight. Then, I did a movie review and wondered what I did with 'Pinocchio'. I must have let someone borrow it. 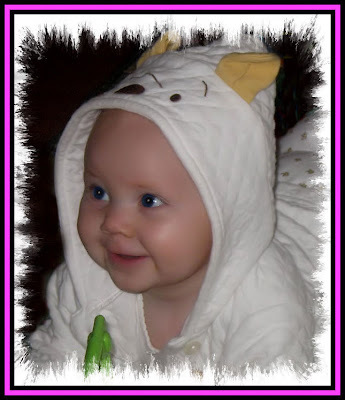 Here is another adorable picture of Miss Savannah. I'm running late this morning because I was selecting Disney movies to bring to her. I also have various Disney music CDs, but I have to look for those as well. I'm running out of time to look! 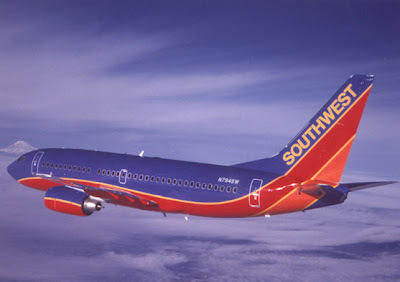 I breathed a big sigh of relief a few minutes ago when I realized I was flying on Southwest and could bring two suitcases! Thank heavens. I am bringing homemade jam with me. The packaging takes up half of one suitcase with a tub and a box so they won't get broken. I'm running late this morning, so I'll just do a 'drive by blogging' and tell a short story. The morning news showed a photo of a middle aged man who was arrested for causing a death from a multi-vehicle accident. He was racing AND driving recklessly. The police spokesman said he was 'surprised' to see a 48-year old man acting that way, that he should know better. HELLO - that 48 year old man bought a white Mustang - he knew exactly what he was doing, and it's called a midlife crisis. Day 1003 - Lets hear it for ab-normal! Here's a photo of the view from the porch in our cabin. The view would be even nicer without other cabins, but since I was in one, the other neighbors were probably thinking the same thing. You know what? 'Normal' is overrated. I saw a window sticker on a minivan yesterday. The sticker said 'Having Debt is Normal. BE WEIRD'. I agree. The banks aren't giving US anything for saving money - so why give THEM lots of money in interest? Fight back by paying it off early! Making payments on THEIR schedule only maximizes the money THEY make, meaning the money you end up paying vs. the original debt. I wish everyone understood that. It is SUCH a racket! Pay attention to those interest charges, that is money you are 'spending' without even knowing it - and getting nothing for it. Thud. I just fell off my high horse. Have a nice day! Day 1002 - Monday morning AGAIN! Here is a photo I took yesterday morning in Wears Valley, TN. (I was driving down 321 on the way back home). Gorgeous! 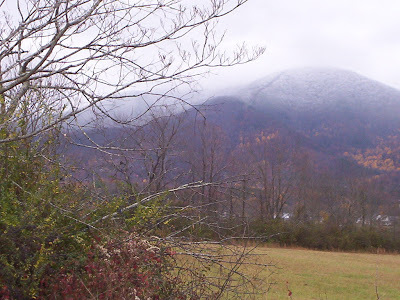 You can see the snow and frost on the upper third of the mountain. I'm sorry the photo isn't perfectly clear, but the weather was still foggy and gray with snow flurries off and on yesterday morning. It's about 250 miles door to door (each way) from the cabin we stay in to my house. I stopped once each way for a pit stop and an additional time to buy gas. Thank heavens for the reduction in gas prices, my fill up on the way there was $16, and $20 on the way home. $36 in gas for a beautiful mountain weekend? No problemo! Of course I did some shopping too! We also went on a scenic Christmas light trolley tour one night. We watched lots of movies, ate way too much, and generally had a great time! I have unpacked my suitcase and started packing for Thanksgiving week in New England. I leave Saturday afternoon! I am driving back from the Smokies today. Greetings, Bloggy Dudes and Dudettes! Happy 1000 day anniversary! 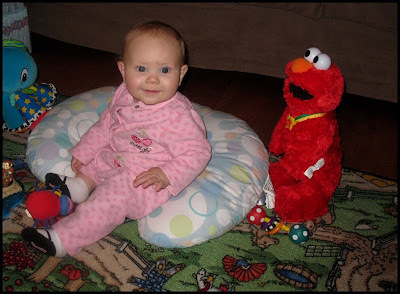 Look how happy Savannah and Elmo are!Yay!! 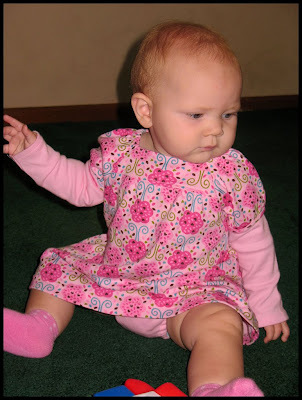 ONE THOUSAND DAYS of blogging, and almost 1000 blog entries. Actually, I think it is 962 individual blog postings. One thousand days goes by pretty fast, doesn't it? What all has happened during that time? I've only cleaned my oven once or twice. Should I admit that? I haven't made any homemade wontons lately, but I still love wonton soup. I've seen lots of movies. I've done a lot of work. I've been on a cruise. And here I am - writing my blog in advance (I'm in the Smoky Mountains right now) to celebrate my 1000th day of blogging. TTFN and have a great 1000th day! Day 999 - Friday and One Thousand Minus ONE! 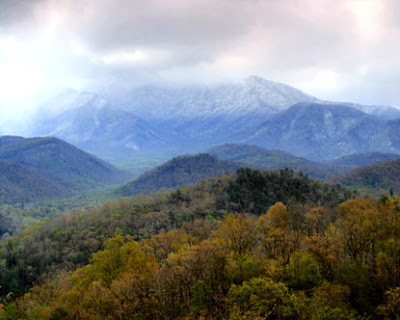 Yes, this is a great photo of the Great Smoky Mountains. If you're reading this on Friday morning, I am driving there right now. I'll be shopping and visiting all weekend with 'the girls' from my old job and various family members and friends. 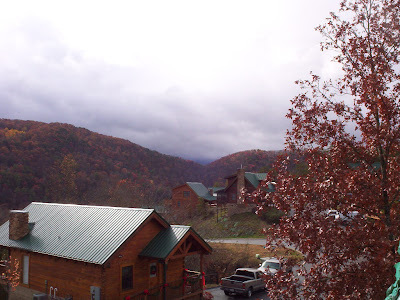 We have a GORGEOUS cabin in Pigeon Forge, TN to stay in, the same cabin we stayed in last year. The name of the cabin is 'Simply the Best', and it is totally true. The cabin has a movie theatre room in it and three jacuzzis - one out on the porch and two in various bedrooms. I'm going to write a blog for tomorrow because tomorrow is 'Day 1000'! Whoo Hoo! 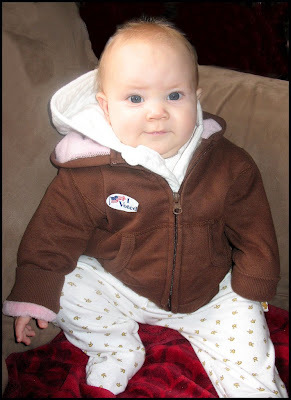 Here is our newest voter with her 'I voted' sticker on. 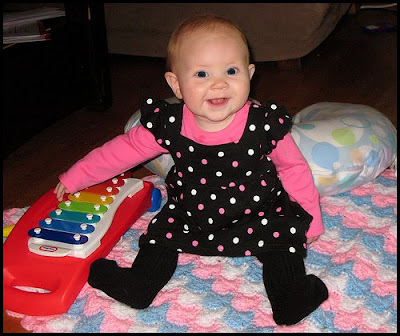 Heather - she looks SO much like her daddy in this photo, even her expression!! That's amazing. Today is my last day of work this week till Monday. Tomorrow morning VERY early I am leaving for Gatlinburg and the mountains for my annual 'getaway girl trip' with the gals from my former work. There are TEN of us going this year (a record), and the cabin we stay in is unbelievably nice. It has a theatre room and free movies to watch! We'll be there till Sunday, but I'll write some blogs tonight to publish while I am away, because I'm going to hit the '1000 days of blogging' mark and I won't even be here! That's kind of funny, isn't it? Thank goodness I can write a blog in advance and publish it on the day I choose. Day 997 - Hey - batting 1000 - almost! 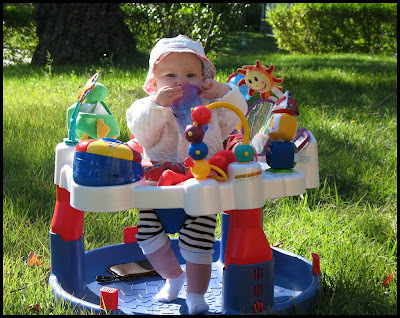 Here is Miss Savannah in her play area - isn't she the big girl now?? I'll be going to see her Thanksgiving week - can't wait! Notice how close I am getting to 'Day 1000' of the blog! Whoa! I just have a quick story about this past weekend to tell. I haven't had time to tell it yet! I went to Sams Club last Friday after work to pick up a few things. I was planning to buy a veggie tray, but the carrots in the tray looked rather dry and whitish rather than glossy and orange. I think this happens if they haven't been stored at just the right temperature or humidity level. The date on them was fine. I asked one of the employees (who doesn't work in produce, just anyone I could find) to look and see if there were any others in the back. She went to look, but no luck. We commiserated about alternatives to the veggie tray. I finally decided just to get some fresh mushrooms, and I would get the other vegetables elsewhere. The Sams Club employee apologized profusely and repeatedly when she couldn't help me. She blurted out 'I know! I recognize you! 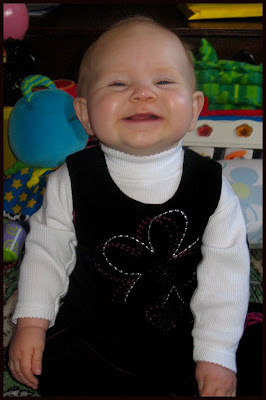 ', then threw her arms around me and HUGGED ME for not being upset! Just writing this made me laugh out loud. I've become a Sams Club regular. Congratulations to me! Day 996 - Happy Veterans Day! Happy Veterans Day and thanks to all the service men and women out there! 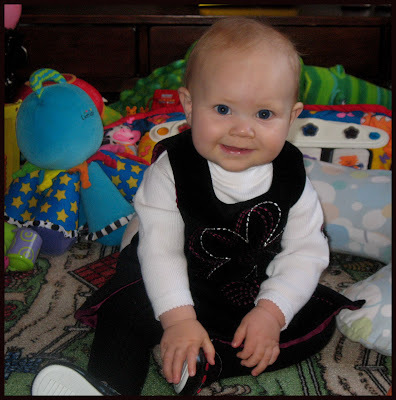 Yay - Monday is over and we have a new and adorable picture of Savannah! Heather - the hood is darling on her but it looks a little like one of those quilted toaster covers they sell at craft fairs. We are having fundraisers all week at work, each 'group' within the computer department is hosting breakfast and lunch each day. Today is sponsored by our group (application development). We are having a pancake breakfast and pizza for lunch. I made toppings - a gallon of blueberry pancake topping, and a gallon of peach, and have three large cans of spray whipped cream. However - lugging in a cooler and two crockpots for all the stuff is less than fun. Thanks, Charlie, for putting everything in the car for me! Day 995 - No time again! The first alarm went off this morning, then the second alarm went off this morning, and I finally woke up (again) at 5:42 - 42 minutes after the first alarm! So - needless to say, no time to blog. I'll have to go to work with my hair wet and groggy-brained. 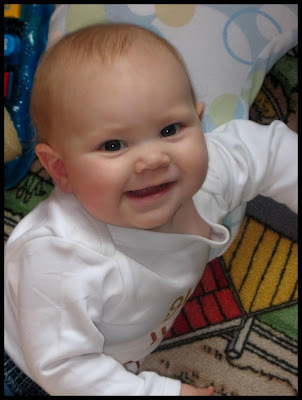 Day 994 - Sorry, no time for bloggage! No time for bloggage here - Charlie and I have already been to the health club this morning, then come home for lunch and we're watching the Titans game. I'm busy doing laundry and starting preparations for my Gatlinburg weekend NEXT weekend with the gals I used to work with. Busy busy - have a nice Sunday! Just a short blog here to say Hello and tell a couple of stories. At Sams Club, they had 'Milk Multipacks' that are sold two to a package. There was a big sign in front of them saying something like 'Sold as one unit', but another note underneath in big letters that said 'DO NOT BUST OPEN'. 'Bust open' is not something I would normally see written on a sign. Speaking of 'fit to bust' - here is a true story from a local school. Thanks to SY for sharing, though I may paraphrase! A little boy whispered to his teacher 'I have something really important to tell you!'. He was very anxious, and 'busting at the seams' to share this piece of news. Hey Heather! I dreamed last night that Savannah could talk! She could say some words to songs, and she said clearly 'You're kidding me!' Ha! I'm running way late - I needed to send some email this morning. In addition, Charlie left early to go hunting so I had to make the bed by myself and fix my foame' vanilla latte' by myself. Life is tough, isn't it? I put some milk in my Lord of the rings Legolas thermos to bring to work for my coffee there. Sometimes I use the instant nonfat dry milk, and sometimes I bring milk to work. I should bring some cereal in too. I have instant oatmeal at work, but I get cravings for cereal and then never eat it. Rock and Roll, Dudes and Dudettes! TTFN! Day 991 - Survivor Night! Greetings, Bloggy Thirstin for Thursdayers! Gosh - is it really Thursday already? I have a lot to do before the end of the week. I don't think I've put this photo on the blog before. Look at her cute little concerned face! What expression! That means it is 'chili salad' night, or 'walkaway taco' night, or whatever you want to call our Thursday dinner. I put tortilla chips or fritos in a bowl, then layer chili, cheese, lettuce, tomato, salsa, and sour cream on top (sometimes black olives but I am out of those). It is a food masterpiece. Uncompensated endorsement: Have you tried the Archer Farms 'blue corn with flax seed' organic tortilla chips that Target sells? They are excellent, AND a reasonable price. The Archer Farms Fair Trade Single Origin organic 'Tierra Del Sol' coffee is excellent too, I bring that in to work sometimes. EEk! It's 6:08 - gotta go! TTFN! This picture made me chuckle out loud. Click on the picture to make it bigger. 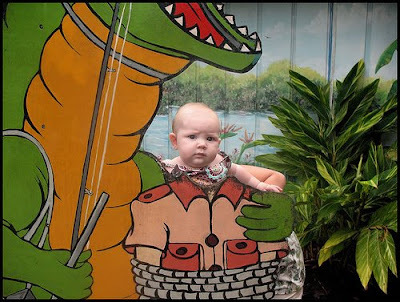 Look at the determination on her little face! She has such attitude for such a little one! 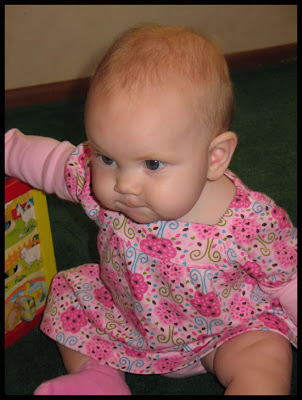 She was probably trying to concentrate on a toy so it would levitate in the air and come over to her using her psychic baby power. Changing subjects - I had a strange dream night before last that two sections of my bedroom wall had bee hives in them! The plaster on the wall was crumbling, exposing their 'nest' within the wall. I asked Charlie to confirm they were honeybees, but I was a bit annoyed that there were bees flying in and out of the house! So - what does that dream mean? By the way - I have dreams about infestations by various insects, usually ants, periodically. Must mean something! Day 989 - Go vote! No time to blog here, I've already been online for work. If you haven't voted - GO DO IT! Nothing Blah about a cute picture of Miss Savannah peeking over her cup. This photo is so colorful! Well, I had a nice weekend despite having to work a little on both Saturday and Sunday. (Not counting already checking on something this morning as well). The Tennessee Titans are 8-0, we passed the stadium yesterday on the way to the fish fry and it was packed all the way up to the 'nosebleed section'. Go Titans! I picked up a fleece Titans jersey this weekend but it's too hot during the day to wear it. It's supposed to cool down this weekend. Gotta go get ready for work - TTFN and have a nice Monday! Day 987 - Did you change your clocks yet? Did you 'fall back' an hour last night? It takes me FOREVER to change the clock in my car, I always forget how! Miss Savannah looks like she's concentrating on telling time - or on something anyway! We have a fish fry to go to this afternoon in Clarksville, TN - a good 60 miles or more from here. Good thing gas prices have gone down. The MEN cook fish, french fries and hushpuppies (cornmeal fritters) in gas powered fryers that they set up in the driveway. The women bring salads and snacks and desserts. It's a fun time! I am bringing sausage balls as an appetizer - you make them with hot sausage, sharp cheddar cheese, and Bisquick baking mix. I did buy the 'Healthy Heart' lower fat Bisquick mix, but they are loaded with calories. I need to catch up on laundry, but I may not get time for any laundry today. It was in the mid 70's today and will be for several days. I need to wear some of my summer clothes and bring a light jacket for later. Gotta go! Have a great Sunday, change your clocks and change your calendars! Day 986 - Happy November! It's November! 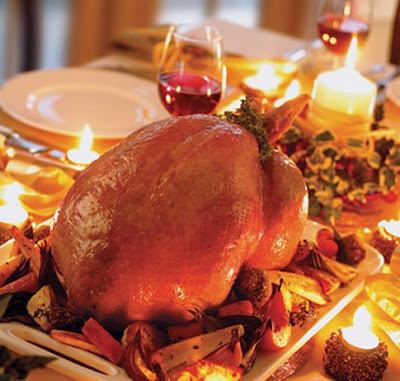 Time to think about Thanksgiving dinner, stuffing and gravy, and cranberry sauce! If you're a turkey, you're shaking in your shoes. Sorry about that. I've got an end of month issue going at work, when that is resolved I'm going out the door to water aerobics and Saturday shoppage. Have a nice Saturday and turn your calendars!